Friends have been joining me this week on Instagram to daily share things that we are thankful for. So much! I am thankful to God for so much! Last week on his way to his parents, my husband got a flat tire on his truck. Then Saturday afternoon, a blow out on a fairly new tire on our camper caused three holes under the camper. But each time, my husband and kids were safe. The girls and I are heading to the coast for the weekend, and yesterday he got two new tires for my van. My dear husband watches out for me and the kids. And he does things just because he knows that it will make us happy. How much more does our God do that! This clothesline was built by my husband just because I wanted one. I have precious memories of hanging clothes out with my grandmother and then my daddy doing that for her. 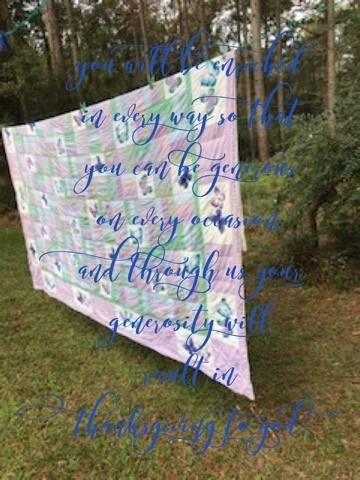 I'm thankful as I hang things on the clothesline. A beautiful way to spread the Word. Keep it up! Wonderful post! It is so good to take note of all things - big and small - for which we are to be grateful. Clotheslines included!!! Blessings! And may we cultivate this same spirit of thankfulness every day of the year! I'm giving thanks every day this month on social media as well. I'm thankful that you host this linkup :). I haven't been doing a daily thankfulness type thing because I've been extremely busy the last few weeks but there is definitely plenty to be thankful for! !